As previously announced, Lexus has debuted their new luxury flagship at the New York autoshow. The LS 600h L (long wheelbase model - only Japan is expected to get the standard length 600h) is claimed to be the quietest (or very near it) luxury car ever - so much so that they had to extensively redesign accessory drives and switches because you could now hear them so well. Power is 430hp (more in a minute) and this is the first all-wheel drive LS. Oh, did I mention that it's a hybrid? Combining a 5.0l V-8 (note, the 'regular' LS makes due with a 4.6l - so this is Lexus' only application of this particular engine) and hybrid drive, routing through a 2-stage CVT (obviously not your typical belt and pulley CVT with this kind of power). The 600h also debuts Toyota's new branding for all their Lexus 'h' cars - they now will tout their use of Lexus Hybrid Drive (vs. Toyota's Synergy Drive). It looks like Lexus is going to focus more closely on the luxury benefits a hybrid system can offer - quieter driving experience w/ more power while Toyota will wisely focus on pure fuel-economy benefits (the slow sales of the Highlander SUV obviously have been heard - it packs more power but not much in the way of better fuel efficiency, thus confusing the Toyota buyer). In another technical first - the 600h will be the world's first use of LED headlights (of course, with recent controversy about Toyota's claims to be 'first' with anything will bear this out pretty quickly - I was almost certain there was another car out there already with some form of LED forward lighting - but I'll need to check). 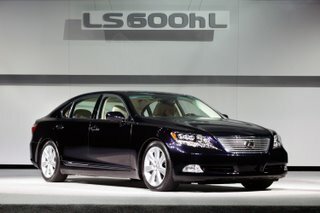 Expect the Lexus LS 600h to debut early in 2007.